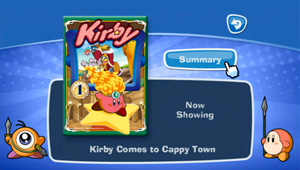 A limited-time TV channel, released exclusively in Europe, showing episodes of the 2003 Kirby animated series "Kirby: Right Back At Ya". Two episodes were released each week, with only four available at a time. Regular viewers could find keys that allowed them to unlock previous episodes in the series.